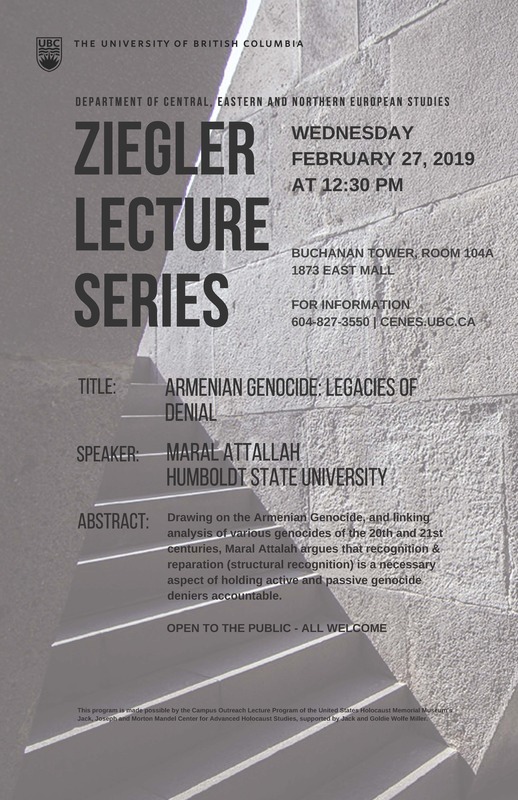 Drawing on the Armenian Genocide, and linking analysis of various genocides of the 20th and 21st centuries, the talk argues that recognition & reparation (structural recognition) is a necessary aspect of holding active and passive genocide deniers accountable. A call for structural recognition inherently promotes active anti-deniers, those who challenge genocide denial and encourage truth and accountability. The talk discusses the contemporary example of Turkey’s overt denial (active) and the United States’ lack of official recognition (passive denial) as indicative of a larger, and more complex, system of genocide denial. Maral Attallah’s areas of specialization include comparative genocide studies, race and ethnic relations, and identity politics. She pays particular attention to issues of colonization, immigration, and recognition of genocide and genocide denial. Her scholarship focuses heavily on exposing the perspectives and voices of marginalized groups in society.